Align customer demand, engineering and production using real-time data and consistent, repeatable processes. Track and respond to changes faster. With centralized revision control, changes to process instructions, specifications, control plans, sourcing and other critical information are made in one place and instantly reflected everywhere so your cross-functional teams automatically stay up-to-date. Drive process standardization and continuous improvement. 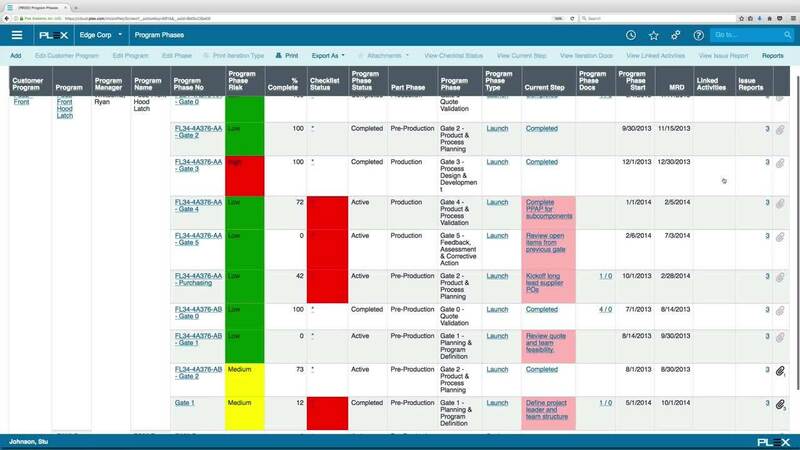 Maintain visibility of program progress with the ability to easily track and report on tasks, schedules and production. Synchronize your data to the Plex Cloud using third-party applications. Ensure that you have the right documents and processes to make the right products. Create and manage complex product configurations and associated process definitions. Manage the details and progress of your internal programs and provide status to customers. Learn how a comprehensive PLM program can improve productivity, accuracy and more. Cloud ERP is uniquely suited to deliver company-wide visibility into your operations. Plex’s solution gives you a common, single source of data to keep everyone working on the correct version of product data.